Welcome back! There are a lot of new pages up on www.magical-azores-islands.com and I'll highlight a few of my favourites in this ezine. A real hot spot - Discover the town of Furnas, Furnas Lake and my surprise on Furnas Lake. I really enjoy spending time in the capital of the Azores. Ponta Delgada was established in 1499 and was an important point for trade. The city features predominatly cobblestone streets that are quite narrow. There are plenty of little cafes and shops throughout the city as well as several nice parks. The boardwalk along the harbour is quite simple but well worth a walk or two. To give you just a small taste of Ponta Delgada, I have put up this page of Azores Photos of Ponta Delgada. If you go to Sao Miguel, then a visit to Furnas is a great idea. There is a lot to discover in Furnas. The Village of Furnas has large, historic houses that were first built and occupied by wealthy residents of the island. The village itself is nicely landscaped with flowers and trees and features many hot springs known as caldeiras. There are also fountains where you can sample the mineral water. Also in the area is Furnas Lake where you can have a Cozida. A cozida is a stew cooked by putting a pot in the ground for about five hours. The hot springs do the cooking! And if you like beautiful parks or want to take a swim in a warm mineral water pool then a visit to Terra Nostra Park is a must. It is a beautiful park and the pool is always warm because it is filled by a hot mineral water spring. I haven't put many pictures of the park on the site yet. But trust me, it is a beautiful park. I have visited Fire Lake several times over the years. Usually I just drive up the mountain, get out of the car and take some pictures (assuming the fog hasn't rolled in!). The last time I visited Fire Lake, known as Lagoa do Fogo in Portuguese, I decided it was time to make the hike down the crater to the lake. It is well worth it (if you are in good health). The hike down is relatively easy, it's getting back up that is more challenging! But I am glad I did it and look forward to doing it again. I'd really love to hike around the lake. Read more about the hike and see some pictures at my page on Lagoa do Fogo. If you visit in the Summer months, Vila Franca Island is a perfect spot for an afternoon of fun in the sun. It is a short (5 minute) ferry ride from Sao Miguel. I recommend bringing swimming goggles and even a snorkel so you can swim and take a look at some nice fish while swimming in the ocean water. There are actually quite a few other new pages on the site. But I know you only have so much time to read newsletters! I hope you enjoy the links I have provided. 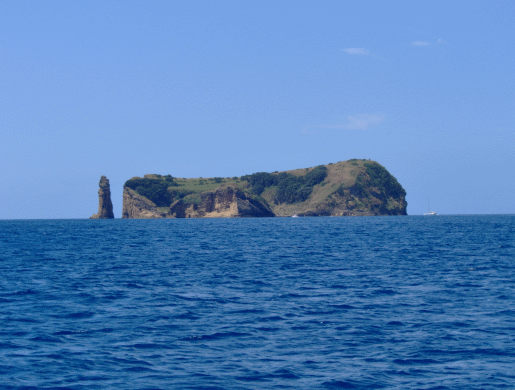 Stay tuned for Magical Azores Islands Ezine #003. It is coming this time next month. Here's a sampling of what you can look forward to. 1. Pictures from the Island of Flores - perhaps the most beautiful island of them all! 4. My top recommendation for accommodations in the Azores - If you want to stay at a magical place on a magical island, be sure to come back next month. It is a simply amazing spot with wonderful hosts. Thanks again for subscribing to this ezine! Be sure to check in at www.magical-azores-islands.com frequently. I am having a great time with the site and hope you like it enough to share with people you know who might be interested in this little known archipelago. PS do you have any comments or suggestions about the site? I appreciate hearing constructive feedback on my comments page.